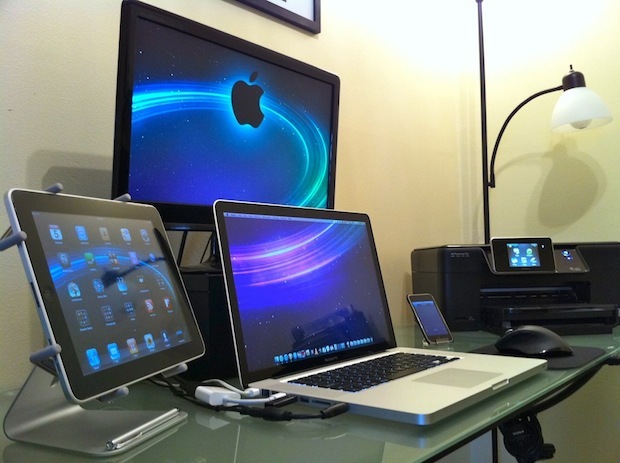 Here’s a 15″ MacBook Pro connected to an external display, and of course an iPad and iPhone complete the setup. MacBook Pro’s with external displays always make a great desktop workstation, the best part of course is that you can disconnect from the external screen and be fully mobile. The iPad stand looks like the elago P2 Stand , which makes an iPad look like a miniature iMac. I think that is the LUXA2 H4 iPad Stand actually. Same general look either way. And this is not a quality to buy ? isn’t it ? Most important is what you do with ? isn’t it too ? They should put the Macbook next to the monitor for maximum usage, or else it’s just in the way. I like the wallpaper on the macbook… any idea where I can find that that one? A display of great lack of taste. its cool! I imagine its pricey, though it looks like it might fit more than just an ipad – looks adjustable. Any idea what it is? Nice items but uhm, horrible setup really. Bluetooth/usb Keyboard+mouse.. get the laptop out of your life if you have the option (my opinion).. i consider my macbookpro to be very fragile (c2duo from 98).. so i avoid touching it if i can.. haha.